A little background on stable isotopes. These are really cool, I promise! So all elements are made up of three sub-elements: a nucleus consisting of 1) protons and 2) neutrons, all orbited by 3) electrons. 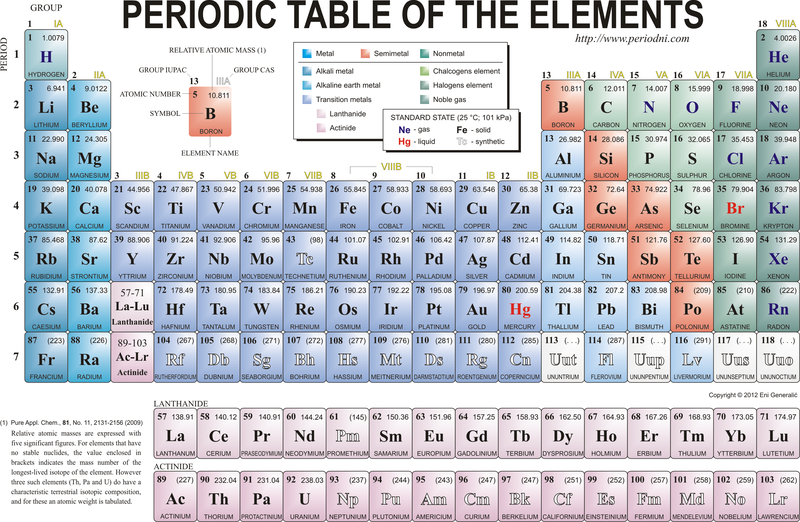 Elements (all the different boxes in the periodic table), are defined by the number of protons and electrons in the element, also known as the ‘atomic number’. Any element on the planet that has 8 protons is Oxygen. Any element with 19 protons is Potassium. Any element with 47 protons is Gold. And so on, and so forth. So the actual definition of an element is the number of protons in the nucleus. In contrast, elements have a semi-flexible number of neutrons. When the number of neutrons changes, but the protons and electrons stay the same, that is an isotope! Example: the element carbon (C) is defined by having 6 protons. The most common form of carbon has 6 protons and 6 neutrons, for a total atomic mass of 12 [atomic mass = number of protons + number of neutrons], and written as 12C. If a carbon has an extra neutron, its atomic mass becomes 13, and we denote this by writing it as 13C. But it is still carbon, because the number of protons hasn’t changed. If it has two extra neutrons, its atomic mass becomes 14, and it’s written as 14C, but it’s still carbon. Protium is what we think of as ‘normal’ hydrogen, with an atomic number of 1, and an atomic mass of 1. Add a neutron and you now have an atomic mass of 2, but it’s still hydrogen, because there is still only one proton. You can also have hydrogen with 2 neutrons, taking the atomic mass to 3, but it’s still hydrogen. Why? Because there’s still only one proton!! Scientists have assigned fancy-sounding names to the different hydrogen isotopes, but they’re all still the element hydrogen. This is so simple it almost hurts my brain. The heavier isotopes (the ones carrying around extra neutrons) will be bent less by the magnet when they’re being flung through the detection chamber. Lighter is easier to throw, easier to manipulate. Like pushing against a solid object – you can push a domino over with a tiny finger shove, but try to push a book over with the same tiny finger shove, and you’ll move it much less. So apply the same magnetic force to all the isotopes, and the flight paths of the heavier ones will be bent less, and so fly off in a trajectory that’s different than its lighter brethren. Then all you have to do is physically place detectors in the different trajectories, and voila! 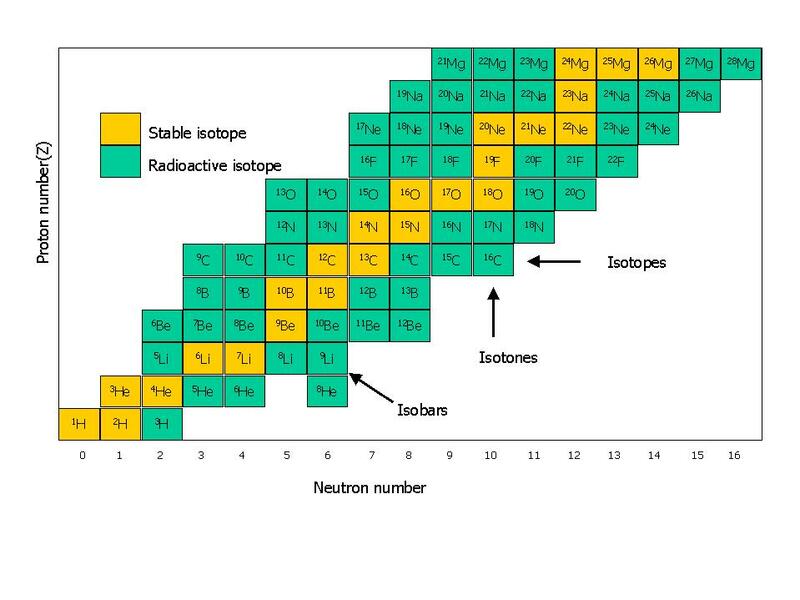 You can measure the amounts of the different isotopes! Moral of the story: My experiment is finished, and now I’m analyzing my stable isotope samples to determine the ratio of 12C to 13C for both CH4 and CO2 molecules. The IRMS here in Kuopio does not have a technician, so I must run my own samples. This is perfectly fine, as long as the machine is working properly, but IRMSes are notoriously mercurial and delicate. I was hoping that my 14-day time slot for the machine, combined with my relatively straightforward samples would mean that I could escape the black hole of an IRMS tantrum, but boy, was I wrong! 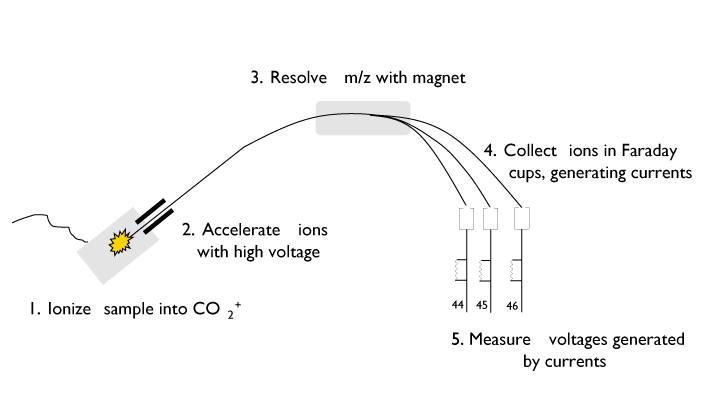 An IRMS can be configured into multiple modes, both for which element you’re measuring, and the method for preparing the sample prior to the ionic slingshot portion of the analysis. 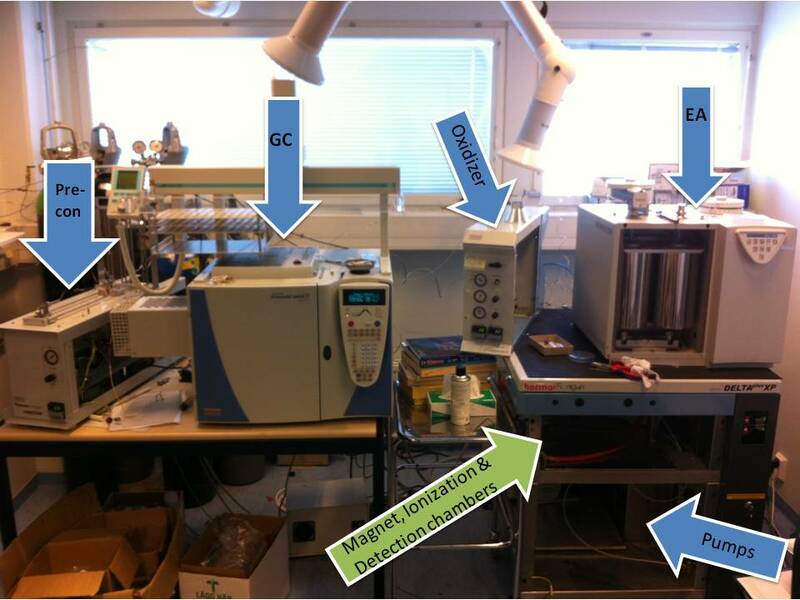 [I use a gas chromatograph for my sample prep mode – the GC part of the GC-IRMS.] 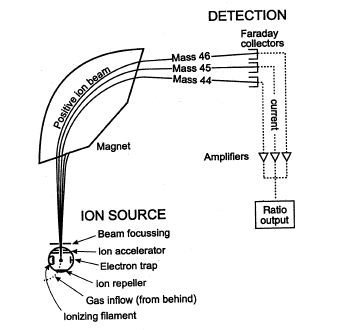 Once through the sample prep portion, a sample enters the “ion source chamber”, where the sample is ionized and then exposed to a high voltage in order to make an “ion beam”, which is shot forward into the magnet chamber, and eventually on to the detector cups for the different isotope masses. I mention this again because this is the portion of the IRMS that broke down on me. 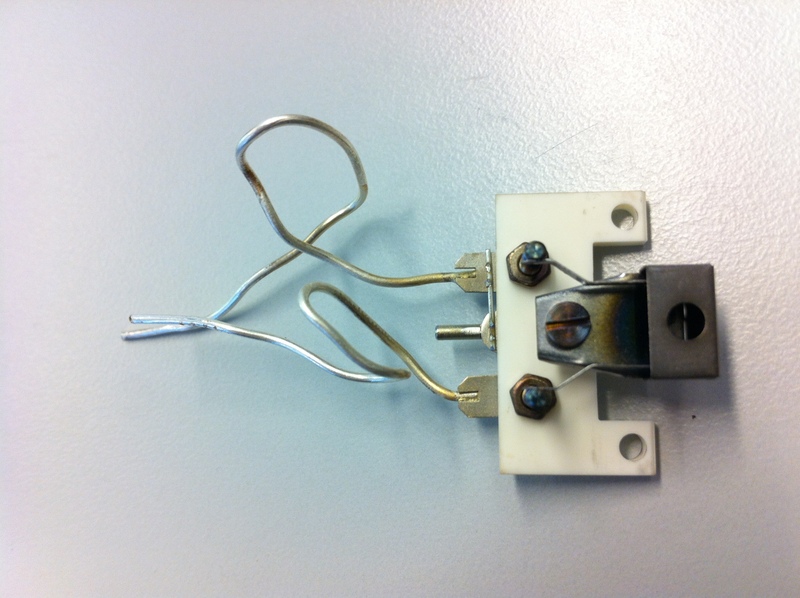 It started with the slow failure of the ionizing filament, and graduated quickly into the total failure of the magnet. Yeah, I thought I’d broken a magnet! I honestly hadn’t even known that was possible (turns out it’s really not). Long story, short: the ionizing filament needed to be replaced, and some electrical issues needed to be resolved to remind the magnet that it wasn’t actually broken. 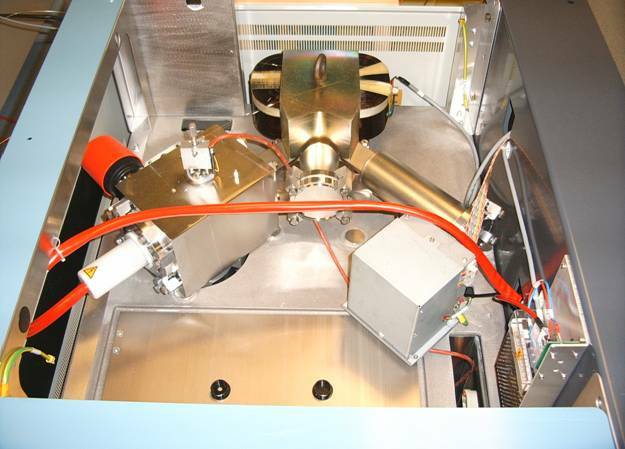 With the indispensable help of two of my fellow PhD students, we had to ‘crack the chest’ of the IRMS and essentially replace its heart (the filament). What follows is a photographic journey of the filament being changed. Here’s a shot of the whole IRMS room, where I’ve pointed out some of the instrumentation (sorry for all the acronyms). 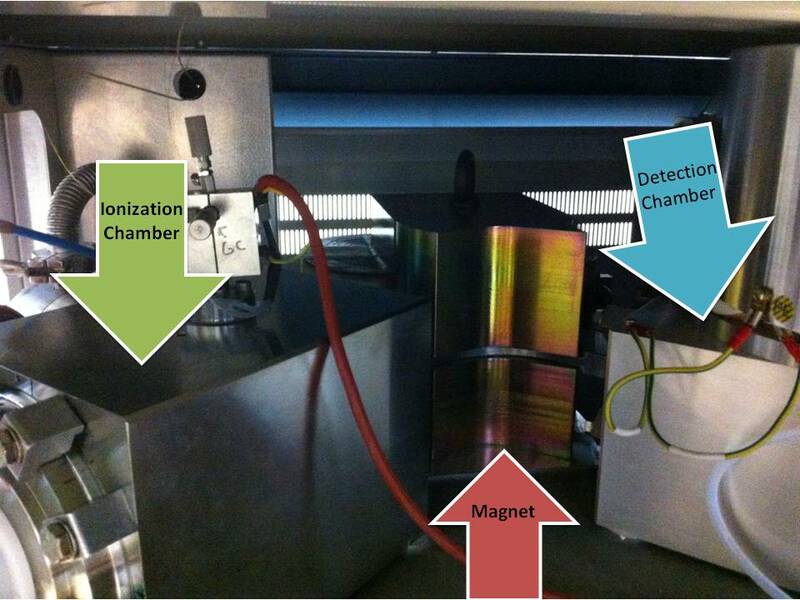 The real meat of the IRMS fits on a single shelf, and is the triple threat of the ionization chamber, the magnet and the detection chamber, the configuration of which has been shown in the two IRMS schematics shown earlier in this post. Okay, so the first step in filament replacement: open the ionization chamber, closed with 8 extremely tight clamp screws. Next: carefully remove the filament housing, without touching it to the chamber walls. 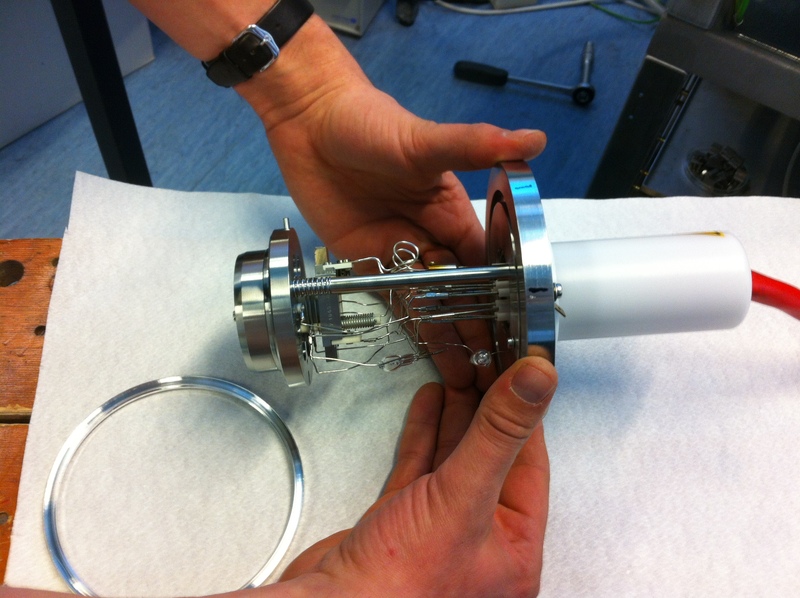 You end up with the ‘heart’ of the IRMS in your hands, or rather, Simo’s hands. Here’s a closer shot of the filament housing unit, containing a LOT of wiring and protective casing for the actual filament, which is tucked into the area amongst all the metal coils, and surrounded by white plastic on the left side of the picture. This is the part that was replaced. The filament is a 1cm-long wire the size of a single strand of hair, held within the metal box with the circle view cutout on the farthest right side of the part. You can see that the hair-sized filament is worn down so that there is a break in what should be a continuous strand of metal. 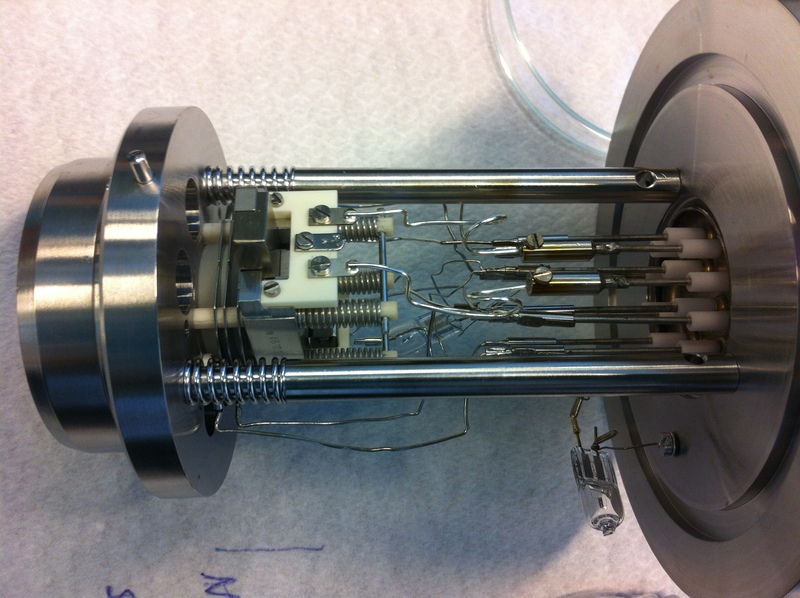 While a colleague placed a new filament unit into the casing, I cleaned out the ionization chamber, which gets microscopically dirty over time. 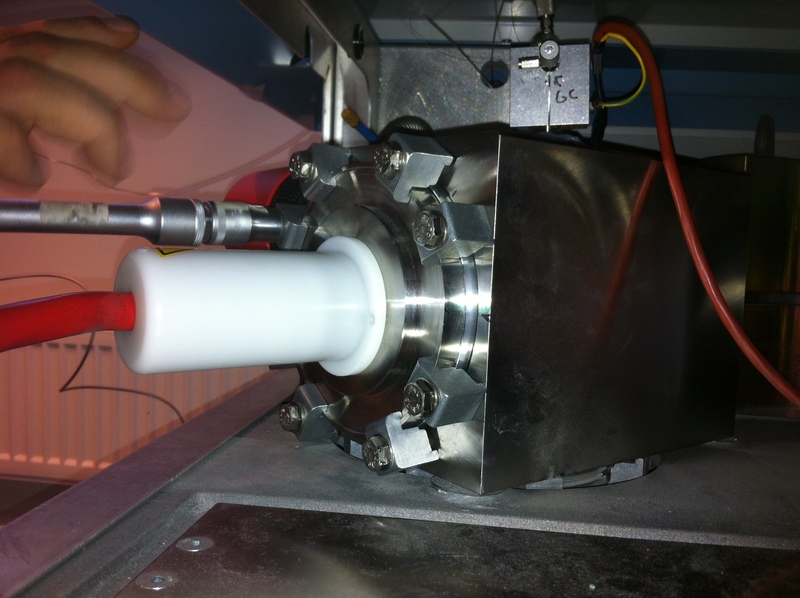 This was like a really high-pressure game of ‘Operation’, because I had to use metal tweezers and an ethanol-soaked cloth to reach all the way to the back of the chamber to clean the ion beam inlet (around 10 inches deep), all while not touching the metal tweezers to any surface. The inside of the chamber is polished metal, and any scratches or imperfections on the surface will affect the ionization. Hence, the extremely high-stakes game of ‘Operation’. Here’s a shot of the inside of the chamber. 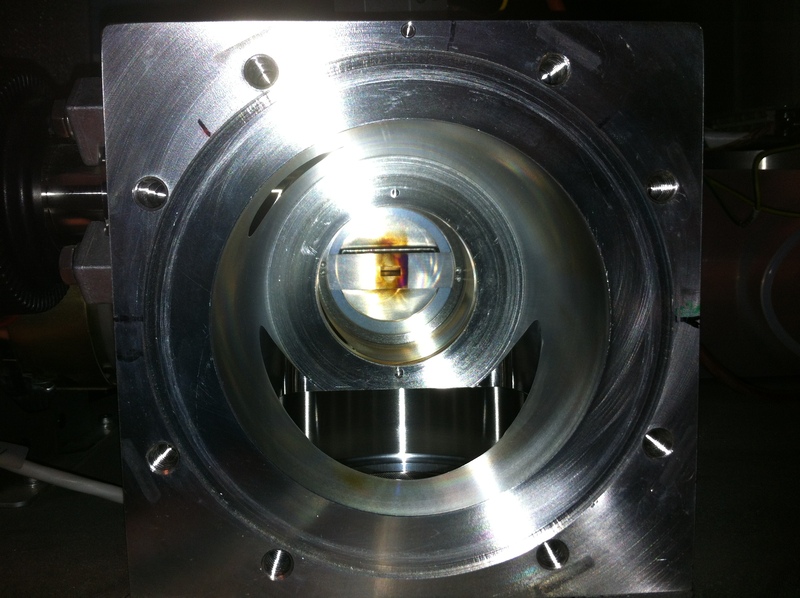 The small slit in the back surrounded by darker, burned-looking marks is the ion beam inlet, so this is where the beam of ions created by the filament is focused and propelled through to the magnet and detectors. Great blog!!!!! How do we reach you in Finland – +011-358-########, address?